I went to the wrong place at first when I was searching for this particular establishment. I went off of an assumption, and was pretty wrong. It's a shame I had to hop that fence and climb down that rock ledge just to get into Cooper's Cave, only to realize that isn't where the brewery is located. History: In 1997, Edward Bethel was asked to move to Mexico for his job. He said "Lo siento, Señors," and then decided to open his own brewery with his wife Patty and son Adrian. They began by leasing out the front end of an old machine shop, where they sold their growlers to local patrons. Eventually, the Warren County Bikeway would bring along a large customer base, and allow the small retail shop to expand. Cooper's Cave now owns the entire building they started in, as well as the building next to it. They have expanded from a small retailer to a successful brewery, ice cream shop, and restaurant/pub. Number of Brews: 12 beers are always on tap at the pub, though 20-30 different styles will come and go during the course of a year. The brews range from a sweet, blueberry flavored ale to a hard-nosed IPA filled with aroma and bitter, hoppy-flavor. What Makes Them Unique: In the words of Patty Bethel, "No beer bottles, no big screens, no B.S." This pub has deeply-knitted community connections; it's exactly what you think it is, and that's exactly how it should be. The humble beginnings of the operation are not lost; Patty is lively and can be seen serving drinks, thanking her customers, and of course smiling, because she has created a bar that she would want to go to. The Lessons I Learned:If a beer has the word "America" in it, it's probably awesome. When I drank the "American IPA" I was pretty much in heaven; it not only lives up to its name, it exceeds its expectations. The best way to describe it is as the Bald Eagle of beers. The next stop on my quest was Davidson Brothers. I was particularly excited for this one. Why? Because it's only a short walk away from my office and I was having a very busy day of calling clients; I needed a pick-me-up. History: The Davidsons bought the 184 Glen Street location in February of 1996 and opened the brewpub for businesses later on that year. Over the course of nearly two decades, Davidson Brothers has established itself as one of the premier breweries in the region and has achieved a local fan-base of regulars. They also recently opened a 20,000 sq. foot brewery and tasting room along Route 9, Queensbury. Number of Brews: 10 offerings are currently available on draft. What Makes Them Unique: The building itself has a feeling of history to it; it creates an atmosphere that transcends the regular pub setting and dips into feelings of nostalgia. You can't help but wonder what downtown section of "Hometown USA" used to look like while visiting Davidson Brothers. The Lessons I Learned: Day drinking is no longer kosher; it is another habit I need to leave at college. Although logic would suggest drinking during the workday would make me happier and more productive, it actually made me get a pretty awful headache and develop a slight speech impediment while calling clients. The more you know, right? Favorite Beer: The Scotch Ale. The next stop on my educational journey was the Adirondack Pub & Brewery, conveniently located right in Lake George Village. The day was beautiful, I stopped in Shephard's Park for a bit just to look out on the lake and take in the sun. The village is beautiful of course, but when you're walking the entirety of the strip, you're bound to see some things that make you need a drink at the Pub. History: 15 years ago, John Carr decided he didn't want to brew only for friends and family anymore; it was time to take his talents to Lake George Village to share with the public. He bought the Lake George Superette and turned it into a restaurant and brewery, where he would soon find success. Over the years the company has grown steadily, increasing their capacity 3 years ago to be able to brew up to 15,000 barrels per year. They also have big plans for the future! They just bought a 4-acre plot across the street which will allow them to continue their growth, and as a result, continue to spread the joy that is their beer. Number of Brews: 12 beers are currently on tap. 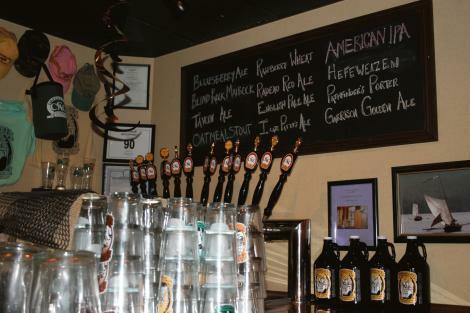 These beers range from their "Bear Naked Ale" to their "Headwater Hefe." If you're into variety, this place has got some serious range. 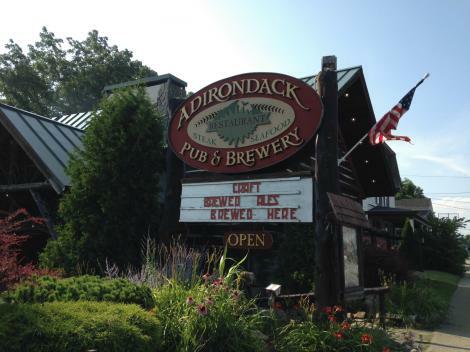 What Makes Them Unique: Adirondack Pub and Brewery has a secret weapon: Nathan the brewer. 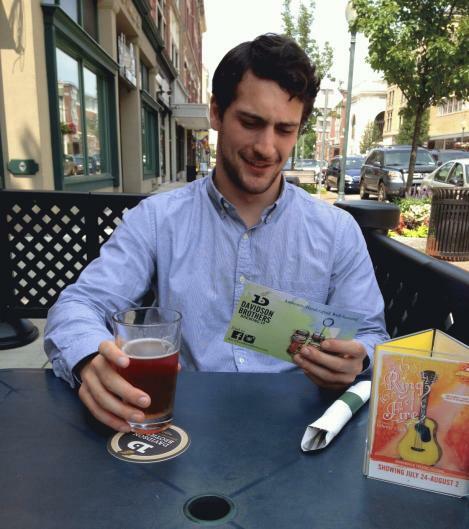 Nathan is more of a scientist than anything; he doesn't see beer as a beverage, as much as he sees it as a result of careful planning and calculated design. Heading up an in-house lab, Nathan acts like a mad scientist spending countless hours making sure that the beer that we drink is as close to perfect as it can be. There's a reason the Bear Naked Ale tastes so freakin' good. The Lessons I Learned: This place is a "must-go" for any tourist who is visiting Lake George. The brewers pride themselves in their craft, but they also pride themselves in their community.This local hangout is open year round and hosts various special events, such as Oktoberfest and The Festival of Barrels, where hundreds come to celebrate and sample beers brewed specifically for the events. I wish I had known this sooner... I've been missing out for far too long. First off, the name of this place is a paradox in itself. For those of you who aren't local, Paradox Lake and Schroon Lake are about 10 miles away from each other... this brewery is located in Schroon. I spent about 20 minutes in the car with my friend going over the possibile reasons for the name. It got to the point where I began to question whether Google Maps had the address right or whether I was living in an episode of Lost. As it turns out, the answer was pretty simple. History: Joan and Paul Mrocka live on Paradox Lake. 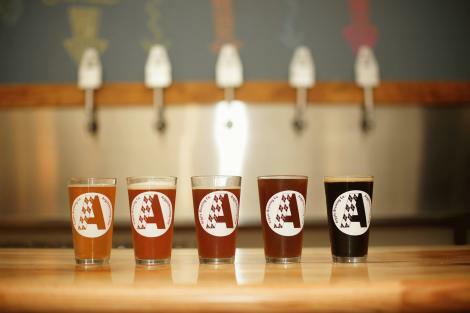 They began brewing at their home years before their Schoon Lake location opened in July 2013. That is why it is called Paradox Brewing... makes sense right? Anyways, the old Schroon Lake Bait and Tackle shop building underwent a 2-year renovation and now serves as their brewing facility. The property features a large backyard that acts as the beer-serving and socializing area. Number of Brews: 7 beers are currently available. The beers are served from tap handles made of quasi-whittled branches... which is completely fitting when you're serving a beer called "Beaver Bite IPA." What Makes Them Unique: You'd be hard-pressed to find another brewery, or any venue, with a backyard that has the same BBQ/family reunion vibe that Paradox has. There's a giant high school graduation-style canopy covering up the tables and serving bar, lawn games all over the place, and people of all ages enjoying themselves. The beer is great; the atmosphere is outstanding. The Lessons I Learned: I learned that sometimes the answers to questions are far more simple than you anticipate. I also learned that even if other people have drank 5 or 6 beers, and I'm completely sober, they'll still beat me at every form of yard-game ever invented. Some things, even after graduation, never change. Argyle, is perhaps the most polarizing pattern in the entire world. Some people love to rock some argyle socks when they hit the links, some have epileptic seizures from looking at the pattern for too long. It's a risk I'm willing to take. History: Matt and Chris, the co-owners of Argyle Brewing, did not always work for the same team. The two met 5 years ago at a brewing competition in Bennington, VT, where they both had entered a Maple Porter and ended up taking first and second in the competition. This made them realize that they could do more together than they could apart. I guess one could call it love at first taste? The pair teamed up and moved back to Argyle. There they started the Argyle Suds Society, and grew the club of backyard brewers to over 50 members. The next step for the team was to open up their own brewery and share their trade with the community. Number of Brews: 6 brews are currently available at the brewery. What Makes Them Unique: The mission of the company is "Grow local, make local, drink local." The brewery is not your typical micro-brewery: they are registered as a New York Farm Brewery in Washington County. This distinction means that they receive at least 20% of their hops/grains from within New York State. This distinction has a few fantastic benefits: it allows their tasting rooms to serve full-pints, they are allowed to cross-pollinate their brewery (can produce/sell hard ciders, sell wine and spirits), and they can open up to 4 more breweries with the New York Farm Brewery title, all while they support local agriculture. The Lessons I Learned: Beer is a polygamous relationship. During my conversation with the owners, I asked what the best beer was, and they honestly couldn't tell me. A love for beer, I have learned, is not restricted to one particular style or brand; it is open to new experiences both good and bad. I graduated from college, and now, I have graduated from Keystone. The world of IPAs and Stouts is frightening at times; it's dark, and sometimes tastes a little bit like flowers, but at the end of the day it is a beer-induced experience, rather than a beer-induced episode of amnesia. I hope that this article has given some of you hope that change is possible. If an ex-fratboy from the #1 party school in the nation can drop his Busch-tallboy and pick up a bottle of local craft beer, you can too. 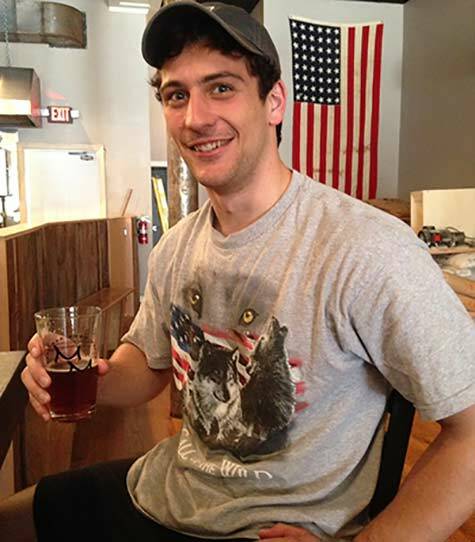 If you are ever in the area, I highly suggest you throw on an American flag/wolf shirt, embrace your free-spirited nature, and visit the 5 favorite local breweries that were featured in this article. Also, be sure to look out for new local breweries, like Mean Max and Common Roots, that are opening in the area soon!